There are both hardware and software requirements for WD Black PCIe SSDs. On hardware side, the motherboard must include an M.2 connector that supports PCIe and NVMe SSDs. On software side, it is important to know, the drivers are a function of the host BIOS and Chip set on the motherboard and Operating System (OS) installed must support PCIe NVMe SSDs. It is best to contact the motherboard or PC manufacturer for possible updates to the BIOS and Chip set and ensure the operating system is current with the latest patches and updates prior to installation of new hardware. These requirements are further explained in the sections below. The WD Black PCIe SSD is an M.2 2280 form factor. It is a standard 22mm wide x 80 mm long, and up to 2.4mm tall.All M.2 NVMe SSDs are a standard 22mm, however, other products may vary in length as 30, 42, 60, 80 or 110 mm. A longer slot space can generally accommodate a shorter device. Thus, the WD Black PCIe SSD can fit into a M.2 2280 or larger slot. However in both cases, it must be securely screwed down with an appropriate retaining screw. To help plug in the correct peripheral type into the target M.2 connector, the standard defines keys A through M on the connector and corresponding notches A through M on the device. A SATA or NVMe SSD. An M.2 SSD connector can have B+M key, or an M key only. The table and figures below shows mechanical compatibility between the SSD connector types and SSD devices. 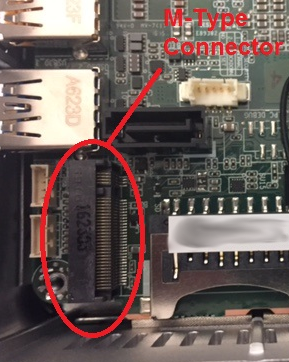 To support a WD Black PCIe SSD, the system must have an M.2 connector with only an M key. The WD Black PCIe SSD does not have a B notch and therefore, the B key on the SSD connector will prevent it from being inserted. Even if the M.2 connector with only an M key can accept a SATA SSD or a PCIe NVMe SSD, the system BIOS must also be capable of supporting a PCIe NVMe SSD. You will need to refer to the technical manual of your system to ensure that a Gen 3 x 4 lane PCIe NVMe SSD is supported in that system. If you wish to install Windows operating system, the BIOS should be configured as UEFI mode with Legacy support disabled. You will also need to boot from UEFI mode for successful Windows installation. Windows 10 and Windows 8.1 have native support for PCIe NVMe SSDs. Their installation packages includes in-box driver that supports PCIe NVMe drives, or allows installation of Intel iRST driver (version 14.8 or newer) to support a PCIe NVMe SSD. Similarly, new versions of Ubuntu and other flavors of Linux support PCIe NVMe SSDs using the newer storage drivers. The WD Black PCIe SSD does not require any special drivers. It supports standard Windows (8.1 and above) in-box, Intel iRST or Linux NVMe storage drivers. While not required as part of installation or normal operation, WD provides a monitoring and FW update tool called WD SSD Dashboard that you can download and install. This tool will allow you to check the health of the drive and perform SSD firmware update, in case a new firmware is released to enhance the stability of the SSD. To learn more about the WD SSD Dashboard, please visit the WD SSD Dashboard Download page.